No one should have to choose between heating and eating; it’s our mission. The Cumberland Wood Bank is a small volunteer-run, non-profit organization focused on providing heating assistance - firewood or alternative fuel sources - to individuals and families in need in Cumberland, Maine and surrounding communities. We are non-judgemental, non-denominational, and non-governmental. Whether you heat with wood or use an alternative source like oil, we can help assist you in staying warm during the cold Maine weather. If you are in Cumberland, Maine or the surrounding communities, contact us. No one should have to sacrifice staying warm; let us help you. 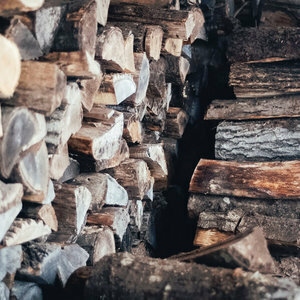 From purchasing firewood to fund alternative fuel heating assistance, to wood donations, to monetary and in-kind donations, there are many ways to help our mission of keeping our community warm. 100% of all funds raised through the sale of firewood go toward heating assistance. We are a small, volunteer-run, non-profit. Your helping hands make a big difference. Whether you’re an individual or a company, let’s join together to help keep our neighbors warm. You don’t need to know how to run a chainsaw or have experience, you just need the drive to make a difference.